It's hard to believe that we've already been in Bali for nearly 2 weeks! So much to update everyone on about our move and transition into life in Bali, but today we wanted to share something really special with you, and ask for your help. As we travel more and more, something that we are really passionate about is placing value on the people and the places that we encounter. Our hope is that our experiences can bring light and awareness not only to amazing places, but also to amazing people and organizations around the world that are making a difference! We're continually finding that travel has this brilliant way of opening our hearts to people different than us and connecting our souls to the humanity that we all share. As you may know, Bali's largest volcano, Mount Agung, has gone into the highest alert for volcanic activity. That basically means that a massive volcanic eruption could happen any day now, and the Indonesian government has evacuated all of the red zones on and around the mountain to keep people out of harms way, if the volcano were the to erupt. What that has translated to is nearly 140,000 displaced people from Bali's poorest and most fragile communities, now forced to live in makeshift camps while they wait for a possible disaster to strike. Numerous humanitarian aid organizations are on the ground and bringing support to the evacuee camps, but a major problem is the lack of access to safe drinking water. According to the World Health Organization, "Some 842 000 people are estimated to die each year from diarrhoea as a result of unsafe drinking-water, sanitation, and hand hygiene. Yet diarrhoea is largely preventable, and the deaths of 361 000 children aged under 5 years could be avoided each year if these risk factors were addressed." Many of these evacuees live in rural villages without access to clean drinking water under normal circumstances, and that problem is only compounded in the camps. Yesterday, we had the opportunity to spend the day with an organization here in Bali called Social Impakt- and it was the most incredible thing to see. Social Impakt is based in Bali and sells water filtering jugs to provide safe access to drinkable water and to make an impact on the environmental consequences of plastic waste from water bottles and the resulting CO2 emissions. They are doing amazing work, and were in the middle of a crowd-funding campaign to raise $60,000 for clean water in Bali when the volcano crisis started. Since they were already on the ground and working in the affected areas, they shifted their campaign to prioritize the filters for the 140,000 displaced people in camps instead. We traveled with the founder, Jeroem, to 5 different camps in the village of Selumbung on Bali's east side as he installed the filters and and educated the people on their proper use. It's quite incredible- for $35, one filter can provide safe water for an entire family for 4 years. 4 years!! Social Impakt has 2 days left in their campaign to reach $60,000 for clean water. Since it's a crowd-funding campaign, they only receive the pledged funding if they match or surpass their goal- and we want to help! Imagine you or your children or your grandparents without access to clean water, susceptible to water-borne illness at any time. 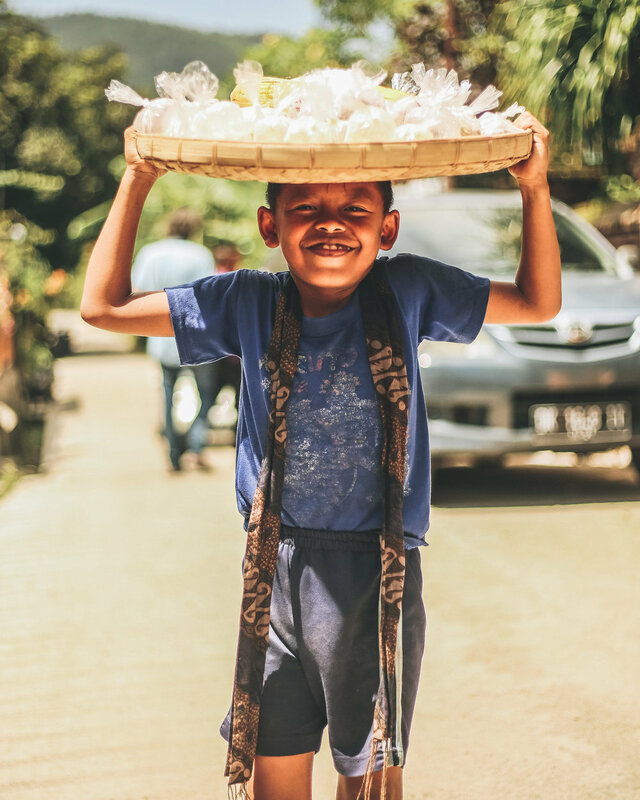 For half the cost of one month's cable bill, the price of a new shirt or one dinner out, you can provide clean water for an entire family in Bali for 4 years. Guys, the power we all possess to change the world is mind-blowing. So we're asking for your help today to change the world in a simple way- would you consider joining us in donating to Social Impakt to help them meet their goal by Saturday? We want to be the type of people who put our money where our mouth is, and place value on everyone we have the honor of meeting- and we know that together, we can all change the world.